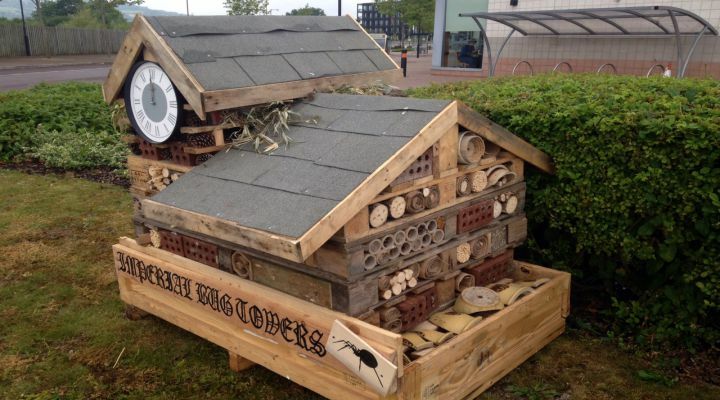 The onsite teams at Hammerson’s retail parks were tasked with the exciting challenge of structuring a ‘bug hotel’ on their retail grounds. The competition was designed to enhance the biodiversity of their local area, creating a structure made completely from natural or waste materials. The hotels were completely free to build and no costs were incurred as the materials were donated by tenants or taken from the service yard. The initiative was a great way to get the local school children and community involved, informing them about the importance of bugs in the environment and what can be achieved by proactively using natural and waste resources. Onsite security and cleaning teams at Cyfarthfa, Imperial, Orchard, Parc Tawe and St Oswalds all took part in the competition. The participating teams were tested on their practical and creative skills using materials such as hay, wood, brick and old pallets. Our aim was to ensure that through a fun and enjoyable challenge, materials that are otherwise wasted be used in an environmentally friendly and useful outcome. The results were fantastic, ranging from towers to B&B’s making sure that the bugs had a safe and protected habitat, enriching the biodiversity of the local grounds. For the onsite teams, the activity was a great team building exercise and a chance to work together to create something fun and beneficial. The staff completely embraced the spirit of the competition and exhibited friendly competitiveness throughout the task. The winners of the competition were the Imperial Bug Towers at Imperial Retail Park in Bristol. The team demonstrated their talent for design, resourcefulness and imagination.